I finished it! It has taken me a year, but I finished the blanket I have been knitting as a wedding present before my stepdaughter’s wedding! Hurrah! A little more than a year ago, I ordered a mountain of wool from Bendigo Woollen Mills. 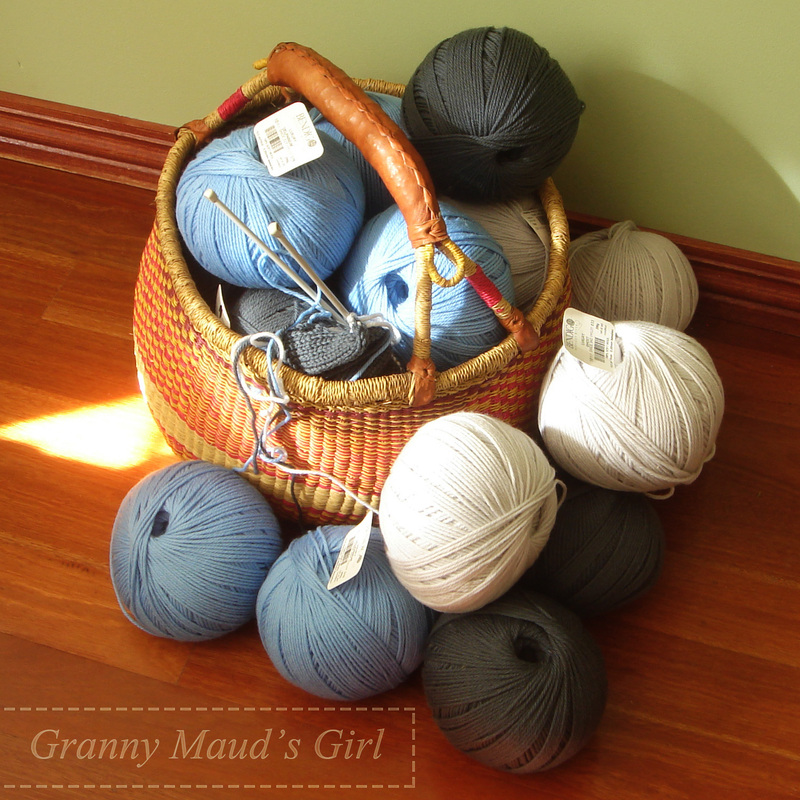 I had thirteen months to knit 4 kilograms of wool. Then, I started knitting test swatches. In spite of a few rough starts, a little bit of cursing and a break for the hot weather of summer (no one wants to be sitting with 4 kilograms of wool on their lap on a 42 degree Celsius day), I kept plodding along. Because I had decided to knit the blanket all in one piece instead of knitting it in strips and then sewing it together as the pattern suggested, the project basket tended to stay by my favourite chair. It was not the sort of project I could pick up and take to my group sewing days. It was just too big and bulky. I always had between three and ten large balls of wool attached, which meant it was not a very portable project. Whenever I was watching television, I chipped away at it until, finally, it was done. This is what the pattern looks like up close. I used Bendigo Woollen Mills’ Luxury 10 ply (worsted or Aran weight). I have a lot of wool left over, about a third of what I bought, so I see matching knitted cushion covers as anniversary presents and the start of a granny square blanket for me in the future. The pattern was a free pattern by Bernat, but I modified it heavily to knit it all in one piece. 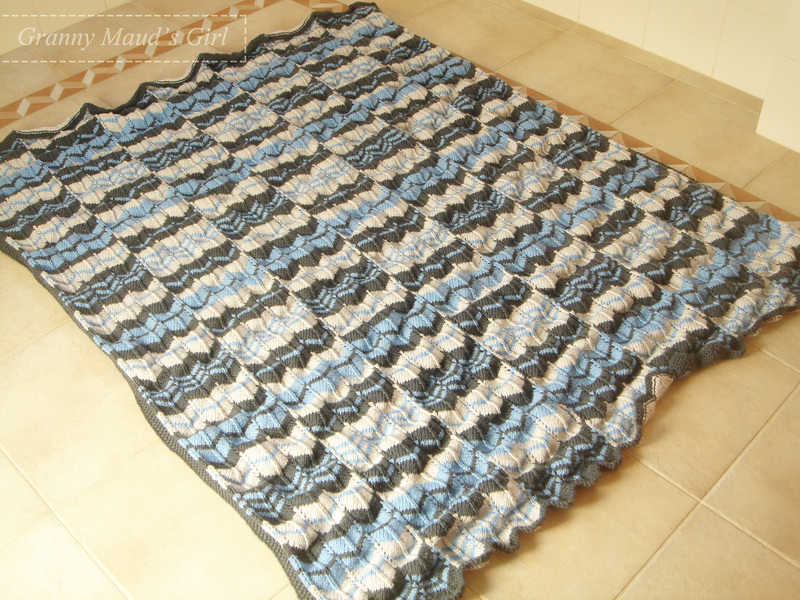 My finished blanket is 53 x 66–70 inches or 135 x 168–178 centimetres. 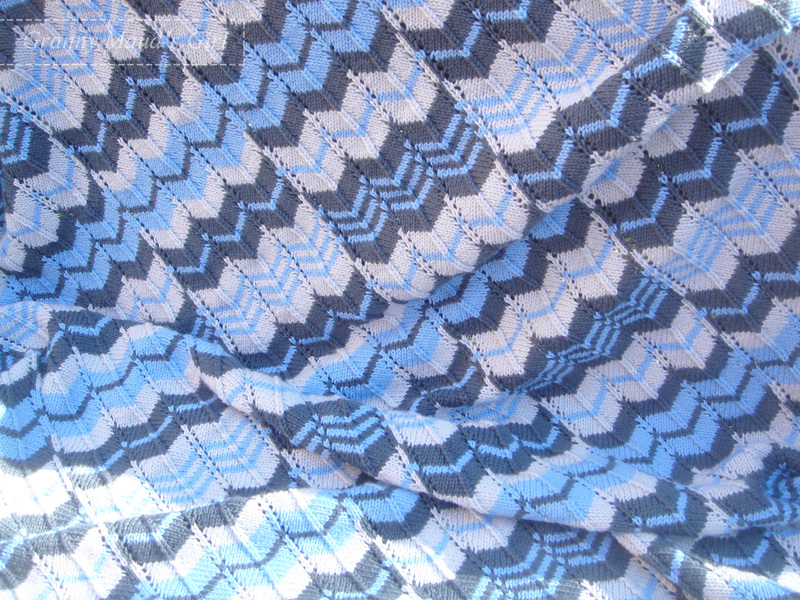 If I were to make this pattern again, I would add an extra stripe on one side to make it a fraction wider. It took a very long time. Two rows took the best part of an hour, and there are a lot of rows. A lot of rows. That is equivalent to a lot of episodes of Poldark taking his shirt off, as well as every dramatisation of every Jane Austen novel ever written, a lot of random movies, and at least one series of Spooks thrown in for good measure. I worked a chained cast on and a traditional cast off for matching first and last rows. Instead of picking up and knitting stitches for the side borders, I knitted the garter-stitch border along with the rest. For neat side edges, I started each border with a slip stitch (knitwise) and ended each row with a purl stitch. I love the neat and non-rolling effect of these slip-stitch selvedges. I knitted some rows ‘backwards’ to minimise the number of yarn joins and ends I had to weave in. By that, I mean I worked from the wrong side and worked the decreases and increases in a purl row instead of a knit row. It was a bit sneaky, but it worked. I accidentally skipped a stripe in the first pattern repeat because I was not paying attention. So, to make it look deliberate, I skipped the same row in the last pattern repeat. Not a design flaw! Nope! Deliberate! I cheated on the two-row stripe in the middle of the wide blue bands. It was supposed to alternate between the two other colours. That was too much needless fiddle. I made it all dark grey. I knitted five pattern repeats. As I knitted, I was a little nervous as the blanket was forming lumps and waves, but a friend from high school, a far more experienced and confident knitter than I am, told me not to panic. She reassured me that it was normal for chevrons and that blocking would fix it. I put my faith in her and, of course, she was right. Before blocking, it was a bit rippled and wavy, and the points on one end were not at all pointy. I used the wet-towel blocking method. I staked it out on the floor using my newly purchased blocking wires and pins, and then I placed wet towels on top of it all and waited until everything dried. Thankfully, no one needed the spare bathroom during those few days. I knew there was a reason we have such a large spare bathroom: for blocking blankets on the floor. The awkwardness of knitting this all in one piece paid off. This blanket is going to be a sofa throw rug, for draping over laps and watching telly during the cold winters where my stepdaughter lives in country Victoria. 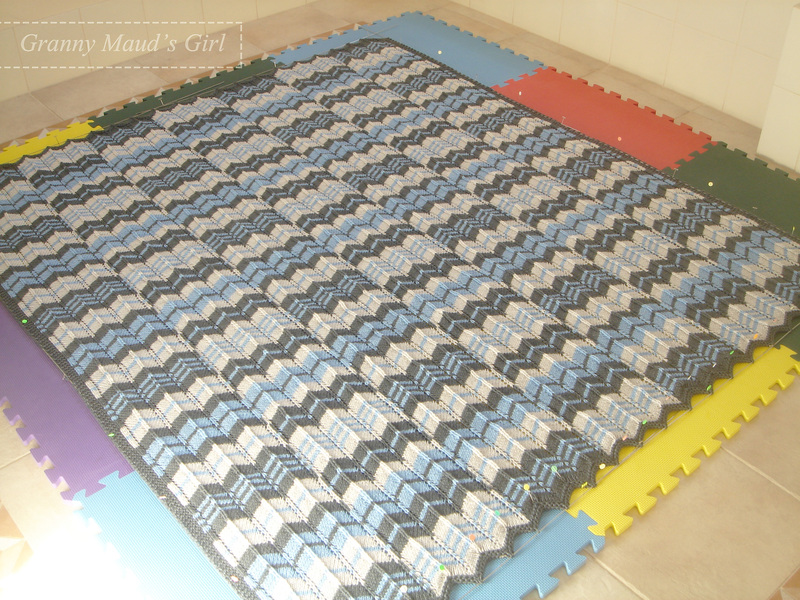 Blankets in use do not sit perfectly flat, they get moved and sometimes the underside shows. I am happy that the back is almost as nice as the front. The effort was worth it. By knitting it all in one piece, I avoided lumpy and unsightly joins on the back. Yes, I know you have already seen this picture, but I am so thrilled to have it finished you have to admire it again. So, that is what I have been doing with my last twelve months. What have you been up to? I have enjoyed this project, in spite of its size. I loved the soft and springy feel of the yarn and look forward to buying more colours from Bendigo Woollen Mills to start my granny square crochet blanket. Secretly, a year ago I was trying to steer the couple down a brightly coloured granny-square-blanket path, but they chose this pattern and these colours instead. They are much younger than I am but have much more grown-up taste! The wedding is in less than two weeks, and I just need to finish the modifications to my dress. My husband and stepdaughter have had words with me. Apparently, a late hand-made wedding present would have been acceptable, but a half-naked stepmother at a wedding is not. Who knew?! I have some French seams to unpick. Fast. Ugh. Wow, well done! A beautiful handmade present is a joy forever. I still love and use the crocheted blanket my nana made me nearly 40 years ago. I can only hope that my knitting is sturdy enough not to unravel after 40 years! Yay for a beautiful finish! 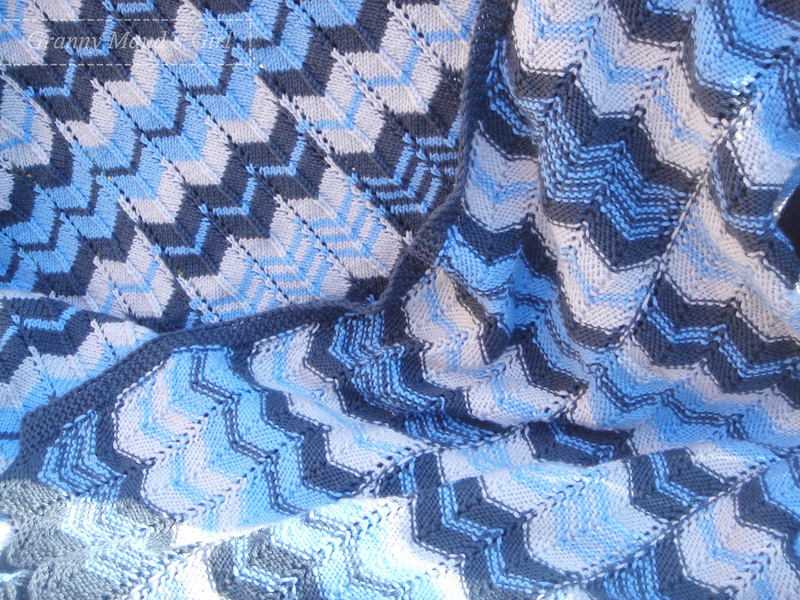 I am not a knitter, and read with amazement the details of this gorgeous blanket! Congratulations….and have a super time with the wedding! Thanks, Sarah. It should be a fun wedding, and I am looking forward to it. Wow. Just… wow! An epic undertaking, successfully achieved and on time too. Now, having managed that splendid piece of work you should cruise through some minor dressmaking mods! I have every confidence in you. The dressmaking will not be too bad, once I stop procrastinating about unpicking those dratted French seams. I do sympathise; French seams look lovely, but it’s twice the work to unpick them! Good idea! I am really dreading having to unpick those seams. Beautiful colors! The favorite blankets around or place are the ones my grandma crocheted for me. I’m sure this will be well-loved and well-used over the years. Great job! I do not have any knitted or crocheted pieces handed down to me. Sad, really. I will just have to make my own! Wow it looks amazing! Well done! Bravo!! It turned out just beautiful. I do remember the pictures you showed too of the start of it all. Well done! The pictures of the mountain of wool and all the test swatches? I am so glad those days are behind me! With less than a fortnight until the wedding, it feels a bit more like scraping through by the skin of my teeth than early to me. Shall we compromise and call it ‘on time’? I think a lot of knitters just pin to carpets, but I am nervous about any dampness making the carpets mildewy. The mats were a bit of an extravagance, but I can see they will get used again if I plan to keep knitting lace and things like this. That is so lovely…. amazing… “wundervoll”! It looks fantastic Carla – Em and James will be thrilled! I hope so, Barb. They helped choose the pattern. I got their input early as I wanted to be sure that they would like whatever I made. Wouldn’t it be awful to spend a year making something that they can only politely thank me for and then shove in the darkest depths of their cupboard! Wow, Carla, it must have been drinks all round in your house last night. 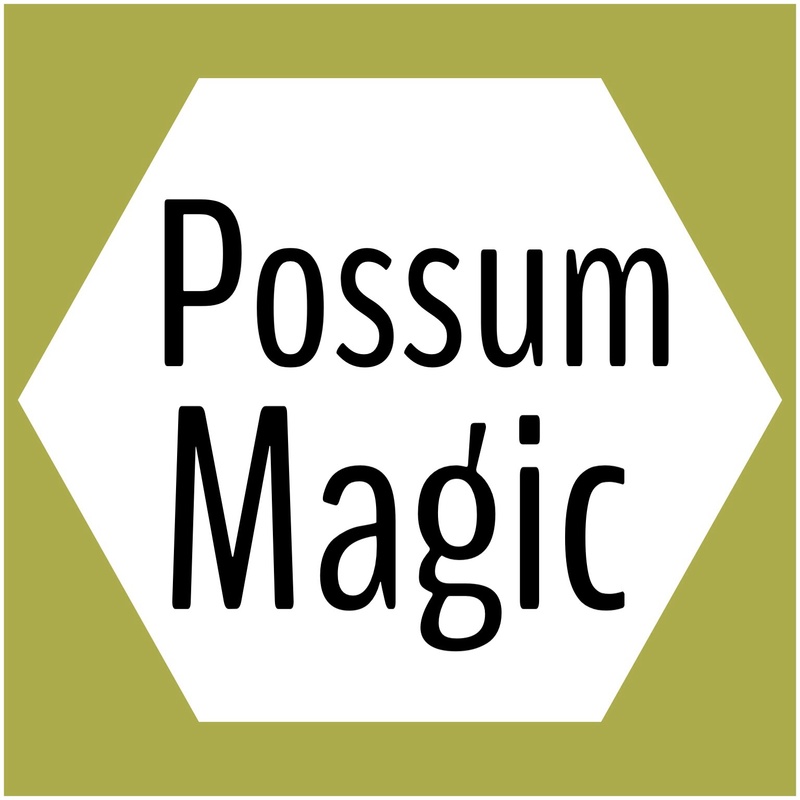 Well done – a major achievement. I’ve read every word of your post, but still can’t think how I could do chevrons in knitting without doing fair isle. Am I missing something? It must be all that increasing and decreasing. I think I would have made a lot more mistakes that you confess too. As soon as I get confident with a pattern I stop paying attention and the mistakes creep in. I hope they treasure it and you don’t get called on to mend holes in it!!! It is exactly that – all the increasing and decreasing. At regular intervals you increase two stitches, knit a bit more and then decrease two stitches, and so on. I am preparing a bag with a few labels from the yarn for washing instructions and a few scraps for repairs if needed. It should be fairly sturdy. As a non-knitter, I am absolutely gobsmacked by this finish. It’s amazing. I can’t imagine keeping all those skeins of wool straight. 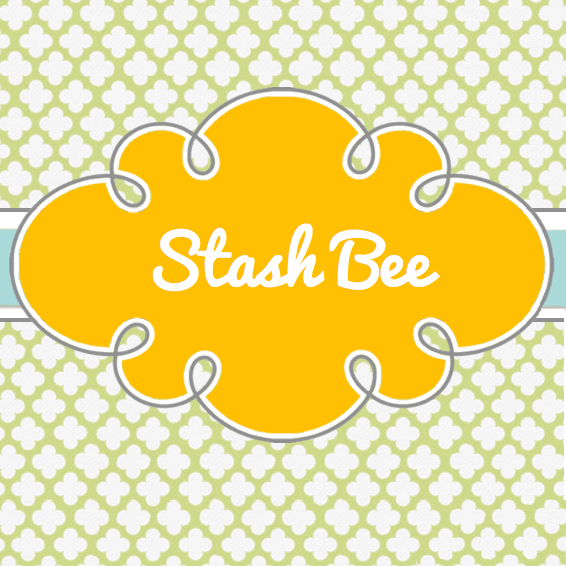 I wish you lived closer so you could teach me how to knit… maybe with a much simpler project. It’s a great regret if mine that I didn’t have enough to patience as a young girl to learn this skill from my grandmother. Keeping them organised was a challenge. I am fortunate to have a long, narrow coffee table, and I lined them up in order. For each row, I had to switch the order of the balls. If you plan to learn to knit, I would recommend starting with one colour! There is plenty of time to learn. Knitting is like riding a bike. 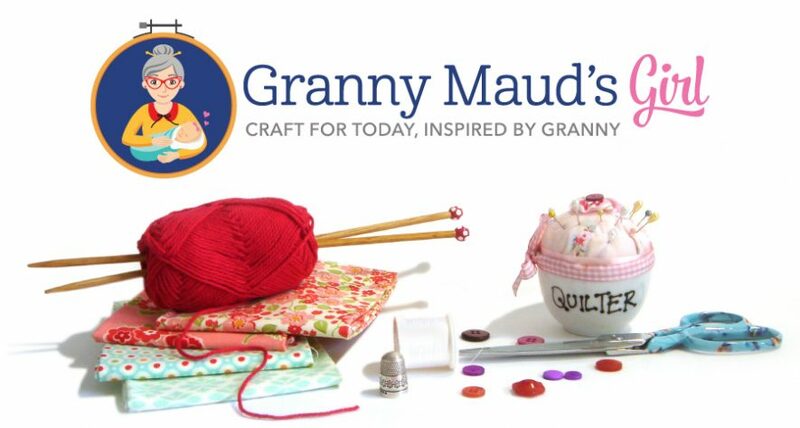 I took a long break from knitting after learning as a teenager, but it all came back to me. I am sure you still have your Brownie skills stored in the back of your mind! Slightly hysterical laugher is the only response I can manage to that, Louise! What a spectacular finish! 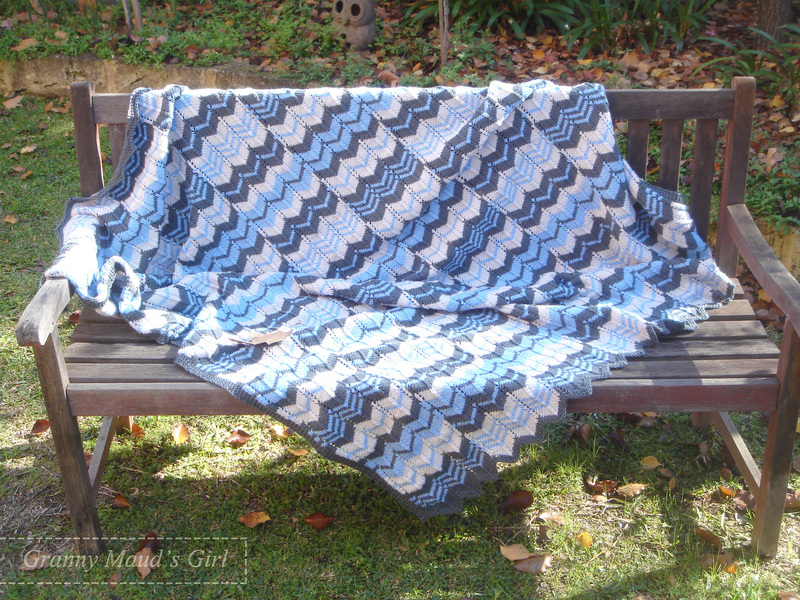 I love the pattern you created with the yarn and the blanket looks so cuddly. I too am really happy with the softness and cuddliness of the pure wool. Nothing scratchy here! Carla, it’s just beautiful! And great job on altering it be one piece. When it comes to knitting I hate joining so I tend to do the same thing. I am STILL working on a sweater that I started over 2 years ago. I’m so close to finishing it but can never get the motivation to work on it. It sits next to my chair in the hopes that I’ll pick it up if I’m watching tv, but it’s gotten very lonely. I’ve only got about 15 more rows (which take about 20 minutes each) but I need to redo the ends of the sleeves, since I don’t like how they turned out. I want them to have a picot edge. Maybe you’ve inspired me to try and pick it back up. Redoing is so discouraging, isn’t it!? I often stall until I get the courage up to redo something. I have massive admiration for you on this one. It is gorgeous and looks so soft in the photos! 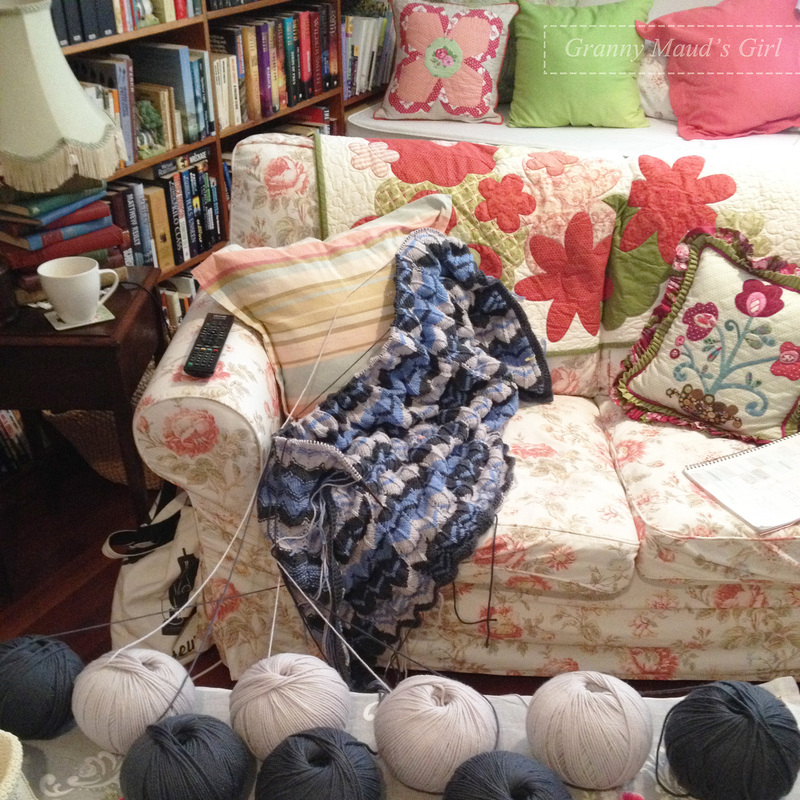 Any knitter will know how much work has gone into this and love it all the more! It really is soft and has a lovely weight. I am so happy with the quality of the wool I bought. As for the work involved – let’s just say that I am glad we only have one child’s wedding present! Wow! That’s fantastic, and super involved. It looks like quite a production with all those balls of yarn attached. A half-naked step-mother would make a wedding that would not be soon forgotten! And remembered for all the wrong reasons! Wow! This is spectacular! I am so impressed you made it in one piece. Have a wonderful wedding! This is absolutely stunning, Carla!! My mom is a knitter and I’m always amazed at how much time it takes to knit. You are so kind to make this and then give it away. Lucky stepdaughter! Unlike sewing, when knitting, the first step is to make your fabric, strand by strand. Daft, really. I am so happy with how it turned out but also so happy we only have one child to knit a wedding present for! I love everything about this and especially your determination to make it as one piece. It gives a much better finish and was well worth the effort. ‘Determination’ is definitely the right word, Avis. I was going to make it work, no matter what! Your blanket turned out amazing, I am sure Em and James were over the moon! I think they liked it. I suspect mine was the only quirky,hand-made wedding present!